On April 6, 1909, American explorers Robert Peary and Matthew Henson claimed to reach the North Pole. After several failed attempts, 23 years of effort, and a lifetime of obsession with the Arctic, Admiral Robert Peary led in April 1909 what was then believed to be the first successful expedition to the North Pole. His stalwart crew, pictured here, included Inuits Ooqeah, Ootah, Egingwah, and Seeglo and fellow American Matthew Henson. Later studies claimed that Peary was actually 30 to 60 miles (50 to 100 kilometers) short of the Pole. 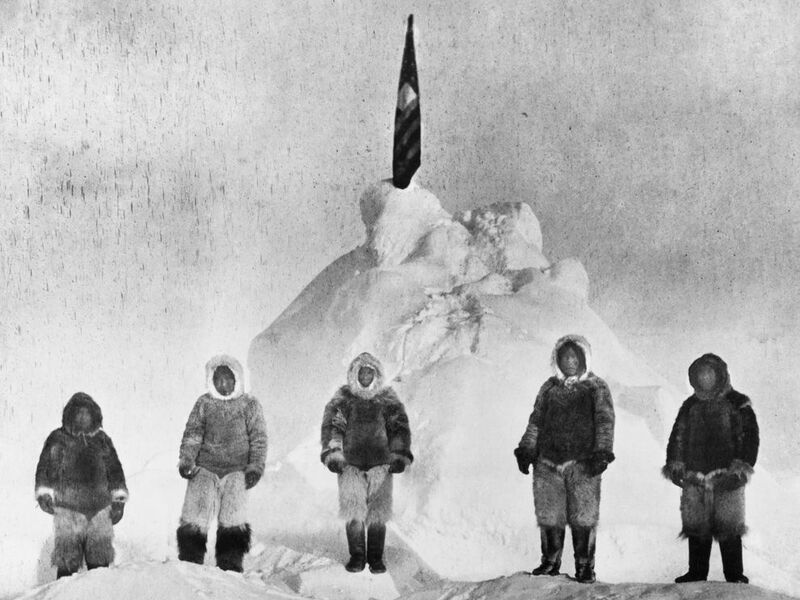 On April 6, 1909, American explorers Robert Peary and Matthew Henson claimed to reach the North Pole. Peary was supported and funded by the National Geographic Society, which verified his claim. It has been in dispute ever since. Peary never made his navigational records available for review, and other members of the expedition could not verify the route. Skeptics have noted the remarkable speed with which the expedition traveled once Capt. Bob Bartlett, the only other navigator besides Peary, left the crew. Peary reported more than doubling the amount of territory covered daily as soon as Bartlett left the expedition. Nonetheless, many explorers support Peary's claims. National Geographic conducted extensive studies of the photographs Peary took, and concluded they were taken within 8 kilometers (5 miles) of the pole. Depth soundings taken by Peary and Henson also seem to support their claim. Perhaps the most important support for Peary's claim came from British explorer Tom Avery's polar expedition of 2005. Avery mimicked Peary's supposed route, using sled dog teams. The expedition successfully reached the North Pole. people and culture native to the Arctic region of eastern Russia, the U.S. state of Alaska, Canada, and Greenland. journey with a specific purpose, such as exploration. to copy another organism's appearance or behavior. (1888) organization whose mission is "Inspiring people to care about the planet." person who doubts the truth or authenticity of something. measurement of the depth of a body of water in a specific area.